Механику исправили через 2 месяца после написания комментария, теперь действительно нужно брать только свои сферы, поэтому вышесказанное не актуально. Включите отслеживание достижения: если оно покраснело, то вы запороли. Отслеживание работает правильно. её удобно поместить рядом с отслеживанием достижения и смотреть, кто же этот буратино, который регулярно запарывает вам достижение. Пожалуй самый сложный ачив в рейде. Вот если бы у игроков свои сферы подсвечивались другим цветом - было бы попроще. Или сделали ачивку персональной. А так это очередной ачив на прок адекватных игроков в рейде. Скорее всего в овергире в конце аддона можно будет просто зергануть босса и лутануть ачивку. Держу в курсе, ачиву пофиксили, теперь можно брать только свои сферы. Похоже прошел какой-то скрытый фикс и ачива делается по описанию. @WarcraftDevs 18:49 - 15 нояб. 2018 г.
Теперь ачив работает так, как гласит описание. УБИРАЙТЕ ПЕТОВ. Варлоки, ханты, шп... Все петы запарывают ачив. Не знаю что и как. 15.01.2018 убили составом 25 человек. 12 человек стояли наверху на платформе Зула, 13 человек снизу убили Митракса. Все получили ачиву. если вы пытаетесь сделать этот ачив в компании адекватных людей, которые вообще не плужат, а по непонятным причинам ачив краснеет (на отслеживании), то проверте состав своего рейда. если у вас в пати есть народ с петами (ханты, маги, локи...), то просто уберите петов. так как петы могут брать чужие сферы и запарывать достижение. Делали этот ачив на прошлой неделе (начало февраля 2019), ачивка багнутая! Запарывается хантовскими петами, поэтому выключайте их всех. И, кстати, персонажи, совершающие суицид - ачивку не получают. I foresee this achievement being the most difficult in Uldir, since you cannot distinguish your own fragments from those spawned by other players. Add the fact that the common strategy, at least right now in the beta, is to leave most existence fragments to tanks, and you have an achievement that requires extreme coordination and very likely a speedkill. November 16 update: The Existential Crisis achievement now functions as described. This makes the achievement much more easier, as you just pick up the orbs that you spawned. We got this on live servers on September 7th, so it is doable, albeit either bugged or misworded. As the achievement reads, you can collect ONLY orbs that YOU spawn. In reality, you can ONLY touch orbs spawned by others. In other words, if anyone touches an orb that they spawned, you lose the achievement. In practice this doesn't sound too bad but it can really get overwhelming. I'll try to include as much detail as I can, and my Btag will be at the bottom of the comment for anyone with questions. A smaller group will find this achievement far easier than a bigger one. Fewer people spawning orbs means fewer orbs down, and fewer people to eat all those extra balls. Our initial team had 26-30 for all the rest of the metas, and ended up splitting into two smaller teams (our was 11) for this one. Even with a small group this achieve is tough. You can only soak balls if you have stacks of Аннигиляция. You will only get stacks from things that also generate balls. The following abilities generate orbs. Разрыв сущности - Frontal cone attack used at the active tank. Spawns a bunch of orbs. The boss should be faced away so that only one tank is hit at a time. Уничтожающий взрыв - Frontal cone attack faced at a random non-tank player. Each person hit generates a few orbs. This should always be dodged during this achievement. Неизбежное уничтожение - Debuff placed on random targets (2 people per cast with an 11 man group) that does dropoff damage upon expiration. Normally you'd go all the way to a wall to drop this, but for the achievement you should avoid this. I'll explain why this is a little more down below. Пробуждение Залзеикса - As you phase transition the boss will zap everyone in the raid, and spawn orbs around each person. These transitions start at 65% and 30%. Разрыв сущности - Is the same as the P1 Essence Shear but comes from the Н'ракский разрушитель mobs instead of the boss. Луч уничтожения - Is a frontal beam the boss channels throughout the phase. The channel happens for about 5 seconds at a time before switching to a new direction. Take a look at the boss to see what direction he's facing. Now in theory this achievement is simple. If you spawn an orb, move away from it and allow it to be soaked by someone else. In practice however, you can't soak all the orbs that were created, and eventually you'll be trying to keep track of where every orb you spawned is. In addition, there are several things that seem to make you instantly pick up your own orbs. First and foremost, if you're about to spawn any orbs STOP MOVING. If you're moving when orbs spawn you can literally colect ne of your own before it appears on your screen. If there's sufficient room around you, the orbs that spawn will always surround you and will NEVER spawn on top of you. However, if you're too close to a wall when spawning orbs, they will occasionally shoot out and land on top of you since the wall is blocking where they were going to land. To prevent this, steer clear of walls, particularly when dropping off Imminent Ruin (since most guilds are likely used to dropping these right against the wall). Hand in hand with the whole "stop moving" theme, don't go barreling off the second your orbs spawn. Take a second and see where they landed. Try to find a quick path that will take you out of your nest of orbs without touching one. If no escape is available, call for someone else to come soak some of them to free you. But don't immediately feel the need to move as soon as you spawn orbs. Slow down. Take a minute. Dodge Obliteration Blast. Many guilds are probably used to not worrying too much about it, since the damage is low and your tanks probably want extra orbs to clear their stacks anyways, but for the achievement it's highly beneficial to avoid them all. Spawning extra orbs that you need to keep track of is not worthwhile. This ability is frequent, but predictable and should be easily dodgeable every time. Tanks take care of each other. What we did looked something like this. Tank 1 had boss on pull, and took the first Essence Shear. Tank 1 spawned 5-6 orbs and waited for them to have landed before navigating out of them. Tank 2 taunted after the Shear and stood nearby, but not stacked on Tank 1's orbs. This is imperative. You want a distinct stack of orbs spawned by each tank, not one big clump of "tank orbs". When Tank 2 takes his first Essence Shear, Tank 1 will taunt the boss back and eat all the orbs Tank 2 just spawned. After he's safely out, Tank 2 will go and eat the 5-6 balls Tank 1 spawned earlier in the fight. Essentially when you taunt off your co-tank, you should look to eat all the balls he just spawned so that he doesn't have to worry about them. When P2 begins, head to whatever side of the room you were assigned to and stop moving. You need to be far enough away from other players that you can tell which orbs are yours so you can avoid them. After the initial burst of orbs spawns, everyone should get out of their area and soak as many orbs as they can as long as you're SURE you didn't spawn them in P1. I can't stress enough that this fight isn't a race and you're better off not taking the chance of soaking an orb that may be one of yours. Once you soak the initial orbs switch to the Destroyer adds and blow them up before they get too many Essence Shears off. We had a DPS assigned to each add full time for kicks, and it was up to this DPS to eat the orbs spawned by the tank taking Essence Shear. You need to do 2 intermission (P2) phases and we found that this is where we most regularly messed up and ate orbs (because there are a LOT of them) so we elected to use Bloodlust in the second P2 so we could get the adds down faster and focus more effort on clearing what orbs we could. Depending on the gear you get here in, you could also lust on pull or after the second P2 to try and burn the boss. That's all the advice I have for you. It sounds like a lot of things to consider but you need to avoid overcomplicating things. If you're going to spawn an orb, wait to see where it lands before you navigate. If you're ever unsure about an orb, avoid it. If you need to get hit by another source that will spawn orbs, or even die, to avoid being moving when orbs are spawning, do it. You dying is fine. You eating one of your orbs because you just had to get out of that Obliteration Blast is not. Slow down. Take your time. Use your eyes and take time to consider where you're going. Smaller groups are better. Hopefully the confusing wording of this achievement will be fixed shortly. Even with the incorrect wording, the achievement will still go from white to red if it's being tracked. Track it, and be ready for a bunch of wipes. 1) Make your players master Spotting - Imminent Ruin begins on you - spot the orb you spawned. Imminent Ruin falls off - spot your orbs. Inescapably going to be hit by a beam? Stop moving, spot your orbs. Tanking? After getting hit by sheer, spot your orbs. Your rotation is ALWAYS secondary to spotting your orbs. There's no DPS race here. 2) Transition Sphere - While hiccups of all sorts are inevitible, I think this is the single deadliest moment in the encounter. There are 2 transition phases. At the start of both transitions, all players will spawn several orbs around themselves - so make sure no players are close to each other so they can clearly identify which orbs are theirs and which belong to someone else. The deadliest moment, however - is that almost simultaneously with the mass orb spawn is an Oblivion Sphere. That means one random player will be placed in a sphere while immediately surrounded by their own orbs. DO NOT rush getting them out. Either wait until they can be very precisely gripped by a priest or deathknight, wait until the transition is over, or very carefully communicate which way they are safe to be knocked away. 3) Communicate Spheres - Fairly straightforward. I would try to announce most beams and spheres a second or two before they were coming out. This wasn't totally necessary, but I wanted to reinforce the "rhythm" to the fight and eliminate surprises and conserve focus. Much more importantly, it's a good idea to have people announce their status when placed in a sphere in the vein of "I'm safe to be knocked out," "I need to be knocked out in X direction," or "I'm surrounded and need a precision grip or help with orbs nearby." 4) Use Every Raid Marker - We gradually came to the following strategy that made the fight much easier. We tanked Mythrax in the center of the room. We placed 3 markers in a triangle around the center circle, with the rest of the markers encircling the rest of the room around the edges. It's helpful to learn where the adds spawn and use those spots as a baseline for the outer markers. This will help your raiders have a much easier sense of space and eliminate a lot of doubt to think "Okay, those definitely aren't my orbs" or "@#$%, are those mine? Better play it safe and change positions." We did not have strict assignments placing player 1 at A, 2 at B to rotate etc. You may want to seriously consider doing this, but we largely left it to intuition. You may also want to try a "square" marker setup around the circle if you have more melee than we did. #@$% Mythrax - If you can beat the second transition, the fights effectively over. We made a point to stop picking up any orbs whatsoever in the final phase and just burn him. We did, however, use lust during the adds in transition two to make sure it was still relatively clean going back to the boss. This achievement is literally Hitler incarnate. This was a lot of pain. We ended up having 3 tanks, 2 of which were refreshing the essence shear debuff and then running around picking up orbs from the rest of the raid to keep it as clean as possible. Doing that also allowed us to have enough stacks of annihilation to clear the room completely in the second phase. Even so this takes a fair bit of coordination and practice, everyone needs to be aware of the timers for the ruin and the blast so that they don't accidentally run into an orb as it spawns. Hopefully this gets fixed either by the correct tool-tip or changed - It's much harder then the other ones. I've sunk a good 8+hours and 150 pulls. The transition is the toughest part to deal with, as Xalzaix's Awakening hits as a person is mind controlled*, making it difficult to knock them out. I dealt with that personally, as my spells are mostly instant cast and I can knock them out where I want to. Afterwards, we all moved clockwise and soaked the next person's orbs. Our tank would place the N'raqi Destroyer along the wall on their assigned side and shimmy clockwise with the rest of the group behind him. Once that add was dealt with, we crossed sides and cleaned up orbs from the other group, killed Visions, and re-positioned where we were in P1. Having only two melee was a substantial boon, limiting the orbs in melee range of the boss. Dps is a non-issue because the boss just melts, so it is definitely more important just to know where your orbs are and trying to keep them bundled, while not screwing yourself. If you have Imminent Ruin and the boss faces you with Obliteration Blast, just take it. You won't die, and neither will any players near you. After we killed the two Destroyers during the second P2, we got to a safe spot and ignored green orbs completely while finishing off Visions. Our two melee were plate dps and occasionally they would take an Essence Shear to get the ability to absorb orbs with the off-tank, giving us more space. We saved lust for the third P1, nuked the boss, and ignored mind controlled players unless they were absolutely safe to be knocked out. I think we had two players mc'd as we killed the boss, so it really has no impact on finishing the fight successfully. Watch your cleaves and assign capable players on knocking people out of mc's. *-When I say mind controlled, I'm talking about Oblivion Spheres. First of all, sorry if my english is not perfect, i hope you'll understand what i mean. We managed to get this Achievement with a PuG without Voice in 5 Pulls. We were 20 people, but you could even do this with 25. The Key is to have a medium to big-size Group and a lot of DPS...Players with sustained less then 12k-13k DPS if they can full DPS (meaning, not getting MC'd) will make this Achievement almost impossible with this Strategy. Move the Boss right to the Center from the Cave (where he stands during his Transition), one Tank in the East of him, the other one in the West. Use 2 Worldmarks for orientation. Now you need two more Marks, about 15 Yard behind the Tank-Position. These marks are a complete "I won't get close to it"-Zone for DPS and Healers. 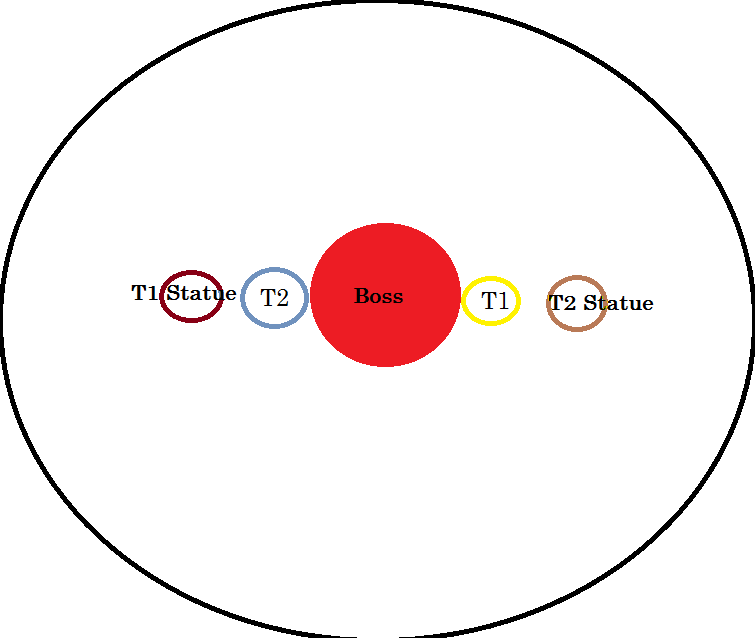 DPS-Players spread around the Boss in a Circle, with a minimum of 10 Yard between each other. Make room for your healers close to the Center, so that they can heal-up everyone. As soon as the Fight starts, everyone run to his Position (assign them, and use the same spot in every single pull). The Brewmasters place their Трансцендентность on their World-Mark and quickly change position to the opposite-Mark (you have enough time before the first Tank-Hit happens, no worries about timing). While falling, set up the Призыв статуи Черного Быка on the "outer" Worldmark on the same side of your own Transcendence. You can now see why you want a maximum of 2 Melees: There is only one spot in the North and one in the South for the Melees to Position, and they can't do any Damage during the Transition (but, as soon as the Big-Adds are dead you can start doing Damage on Mythrax, his Damage-Reuction-Aura breaks when they both die). When everyone reach their position, they stand still, the whole fight. Until the Boss dies. They don't even make a Minimal-Step. Just.stand.still. If a player get into the MC-Orb do.not.touch.them. Even if it's a Healer: Don't touchy touchy da Orb. As soon as the Boss starts his Transition and he finishes his cast, both Tanks teleport to the other side, collect as many Orbs as possible while moving to the outer Mark and tank the Add. DPS nuke the living hell out of these Adds, while still don't moving at all. If they get target by the Beam, immediate call to your Healers (if you use voice) and use a Def CD. If the Healers know that a player get hit by the beam they won't die, the damage is not that high in Normal. Beware: If you call when you already getting damage from the Beam you are dead, Healers have to Spot-Heal you before the Channel starts. As soon as the big Adds are dead, kill and interrupt the Small ones. While DPS focussing down the Adds, both Tanks walking back to the "inner" Worldmark, waiting for the End of the Transition. When all Adds are dead and you still have a white-Achievement, Repeat the fight from now on. It's basically won. The Tanks Swap again when the AE-Cast from the 2nd Intermission finishes. Use Hero to burn Mythrax during Phase 3, if you get there, nothing can really wipe you anymore. Important-Note: Specs with unavoidable Spread-Cleave (esp. Frostmages, Balance-Druids): Get rid of these Spread-Spells as soon as a Melee is caught in a Orb or don't use these Talents, you'll wipe the raid otherwise. Careful not to have anyone equip an azerite piece with Лазерная решетка as it can inadvertently knock people inside Сфера забвения. Had this happen a couple of times during our progress on this achievement before someone checked damage meters. I'll add my two cents for this. We managed to do this over 66 pulls (65 wipes + 1 kill) over two nights on normal difficulty. We combined multiple points from various comments here as well as added something we thought on spot. It does help to have less melee dps, however it is manageable even with melee. One starting concept - DO NOT MOVE unless you have to. We positioned like this https://imgur.com/dudRNv8 - boss at the center of the room, ranged dps spread around somewhere near the marks. We did a lot of pulls with 8 ranged players (healers + rdps) so the positioning like in the picture worked quite well, when +1 rdps joined we shifted marks a bit so a gap for another one "unmarked" spot appeared. That way everyone knew where to stand at the start and where they left their bubbles. Imminent Ruin - we simply did not move. It doesn't matter if you're melee or ranged - the ability itself doesn't do a lot of damage. The important part is to wait until the debuff expires and bubbles are formed so you can carefully step out of it. And as a ranged player myself when I spawned bubbles I simply moved clockwise a bit towards next world marker. Oblivion Sphere - we made sure we only knock out players if they had no green bubbles near them. Most of the time melee could simply knock players backwards towards the wall, due to how we dealt with Imminent Ruin. Obliteration Blast - we hard avoided it as long as it did not cause a risk of stepping into own bubble. It was better to simply stand and take the damage than to pick up own bubble and fail the achievement. However that was rarelly the case as we always could move clockwise and not risk getting own bubble. Essence Shear - we had one tank (a monk) who was dedicated to soaking this ability everytime. One tank simply stood near boss dpsing him, while other soaked every Essence Shear. We actually ended up having an additional melee dps to stand in every Essence Shear since second one. One tank soaked first Essence Shear, left a cluster of green bubbles and simply walked out of them. Since he had Essence Shear debuff he could no longed spawn bubbles so he intentionally soaked every Obliteration Blast getting additional stacks of Annihilation without spawning orbs. Due to that he was able to run around and soak bubbles except for that initial cluster at first Essence Shear. That's where an additional melee stepped in - as he soaked second Essence Shear together with a tank (Essence Shear is a frontal cleave) what happened - tank did not spawn additional bubbles, but get some Annihilation stacks, so he soaked every bubble that was spawned from melee dps, while melee dps soaked initial cluster of tanks bubbles. Since then we had two people running around and soaking every bubble that was there. They just had to come back every 20-ish seconds for Essence Shear cast. Meanwhile ranged players could soak each others bubbles or go to melee range to clear their stacks as long as they were aware where they left their bubbles - and they did that at the designated marker. Following this strategy we went into intermission having little to no bubbles. And then was the hardest part - Xalzaix's Awakening. While boss was casting this ability we had everyone stand still as if they were rooted. We would wait until bubbles spawn, then step out of them and move clockwise to soak bubbles. while this could have been avoided it allowed us to clear our Annihilation stacks and be safe for whole intermission as you cannot fail the achievement if you have no Annihilation stacks. We treated Obliteration Beam as if it was Obliteration Blast - tried to avoid it, but if we got caught in the beam - we stopped and used personal defensives/healing/healtstones and such. After the cast was finished - simply walk out of green bubble cluster. The important thing about intermission - you DO NOT free people from Oblivion Sphere when boss is casting Xalzaix's Awakening. That was a fail almost everytime. After first intermission we did next third of boss HP normally and since second intermission started we had everyone stand still and not move at all untill the end of the raid, except to dodge Obliteration Beam if it was safe to do so. We also stopped freeing people from Oblivion Sphere. If someone got caught - we simply left them be so, and just nuked the boss with bloodlust. It took quite a lot of pulls to polish everything, but at the end we got it working quite nicely. - Standing too close to a wall would end up Imminent Ruin spawn orbs on top of a player. - Imminent Ruin actually spawns orbs twice, first 0-1 orbs when it is applied, and 2-3 orbs when it ends. People often miss the first orb. - Standing still at the start of intermission is crucial. - You have to make absolutely sure before knocking people out of Oblivion Spheres. You can 100% knock a person if he has no stacks or if you made sure there are no bubbles nearby (by running close, moving camera around or simply asking in voice chat). - You have to soak initial cluster of tank bubbles left by Essence Shear. It is too easy to fail it during intermission if you miss even one orb. - If two players stand by 12 yd of one another while either one of them having Imminent Ruin - both of them will spawn orbs as both of them get hit by the ability. - If you have more people in the group - simply adjust number of people getting hit by Essence Shear. This is long and not completely coherent, however the achievement itself is quite hard and requires a lot of personal responsibility. Having done the achievement after more than 220 wipes, I truly hope Blizz won't nerf the achieve into oblivion. If they do, they should at least give the players who already completed it a FoS. So what we did - we had to split our 20man raid into two 10 man raids, we had to choose one spot and than stand still from the beginning to the end, except for tanks ofc, and we just nuked boss down with noone moving. No kicking out of spheres, no avoiding stuff, no collecting ANY green orb, we used bl to second small adds. Avg ilvl of group was 380, we had 2 tanks, 2 melee, 2healers and 4 casters split all over that boss room. Took us +- 25 pulls to do on normal diff OFC! Does not matter now - its fixed. Sadly..
more like luck based crisis, amirite? This achievement has been fixed and works as intended, you can only collect your own orbs. As of some hotfix I don't know when, this achievement works as intended. On 15/11-2018 me and 9 guildies did Mythrax whilst ONLY picking up our own orbs and got the achievement on kill. As of tonight, 11/15/18, this achievement worked as it reads. My 10 man group collected only our orbs and we got the achievement. We've recently applied a couple of hotfixes to the Mythrax encounter: Сфера забвения now prioritizes ranged targets when possible, and the Экзистенциальный кризис achievement now functions as described. Doing this achievement tonight after the hotfix we found out pets hit by Уничтожающий взрыв \ Неизбежное уничтожение spawn orbs and getting that orb WILL fail the achievement, make sure you have NO PETS at all (even things like Поверженное щупальце Г'ууна or mistweaver statue ect). 1) Whole raid everyone 8 yard spreed. 2) If you spawned the orb its now YOUR responsibility to soak it. Thus, we made sure only 3 mele on the boss (excess mele hung out on their assigned side of the room away from the boss and watched till P2. This stopped ruiner from overlapping with anyone causing more orbs and confusion. 2) Communicate! eg "That orb behind the tank is MINE" - this shows the raid you are aware of your own mess to clean up. 3) 0-2 max orbs up going into P2. 4) SPREAD and STAND STILL on T1/T2 and clean up your orbs that spawn on everyone before you deal with adds. 5) On the 2nd P1 - EVERYONE stands still and spreads - no need to soak (hero if not in 2nd P2). 6) No addon needed - no WA needed just track the achievement - if it turns read jump into a sphere to wipe it. NB: Ave ilvl of group 376.3 (combined mythic raider pug / <The DEDICATED> Xrealm community group). Not sure if this is a glitch or not, but the orbs seem to have a "tag" timer that lasts a few seconds. If you don't collect the orb immediately after spawning it, you will fail the achievement upon touching it. Failed an attempt because I touched an orb that I knew was mine (left a Demonic Circle on top of it, one of the spares from the intermission) 10 seconds after it was spawned. TL;DR if you don't grab orbs after they immediately spawn, they'll go bad. This is only able to be done without pets or anything that has a health pool, this is still an issue after patch 8.1 has been released. Wiped for 1.5 hours with pets out, after not having them we completed first attempt. Doing this achievement tonight after the hotfix we found out pets hit by Obliteration Blast \ Imminent Ruin spawn orbs and getting that orb WILL fail the achievement, make sure you have NO PETS at all (even things like Vanquished Tendril of G'huun or mistweaver statue ect). We spent an hour on this before seeing your post. Got it first attempt without pets. THANK YOU! Hard to definitively say because nobody could tell what exactly was failing my group to start, but the number of unexplained failures went down significantly after removing pets from the raid, and we got it within four or five pulls. Победите Митракса Развоплотителя в Ульдире таким образом, чтобы никто из игроков не дотронулся до фрагмента сущего, порожденного другим игроком, в обычном или более сложном режиме.